With 8 billion humans and growing, it’s not only a ‘good idea’, but an absolute necessity that we become more and more cognizant of the brands we choose to support. From swim suits to home goods, here is a roundup of 11 sustainable brands that will make you look & feel good. Founded in 2000 by California native Amahlia Stevens, Vitamin A combines feminine design with sustainable innovation. Their bikinis are designed and produced locally in California with exceptional attention to detail, in their signature EcoLux fabric- a technically and environmentally superior luxe fabric, made from recycled nylon. SHOP HERE. Clean up your cleaning products! Yes, I use these in my own home and can vouch for their effectiveness! SHOP HERE. In searching for cool ethical brands, I discovered Brazillian based contemporary brand, Osklen. They are committed to being ‘ASAP,’ or ‘As Sustainable As Possible.’ It bases itself on environmental, cultural and educational initiatives of social responsibility and assistance with the goal to promote human sustainable development mainly in Brazil, but also in other countries, through creative thinking and action. Their brand is completely transparent from production to packaging and have a wide range of clothing for men and women as well as shoes and accessories. SHOP HERE. They strive for complete transparency and are happy to answer any and every question you have about their production process. Email them at info@pansy.co. SHOP HERE. 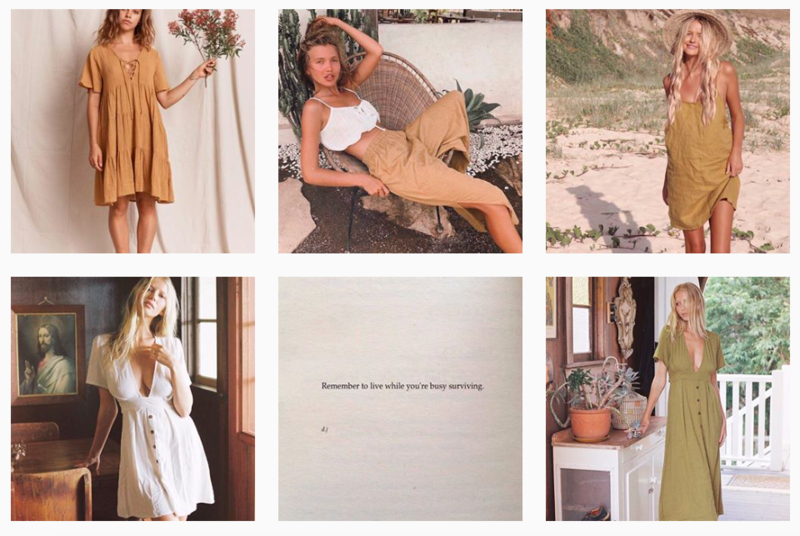 Opia is an independent Byron Bay based clothing label producing simplistic, delicate clothing for everyday wear, inspired by a love of nature and the ocean. They are committed to reasonless, sustainable fashion with a focus on achieving rich colourways from plant based, raw materials, and garments made in small production runs to ensure sustainable and ethically made clothing. SHOP HERE. I was drawn to this brand because of their minimalist jewelry (which is very affordable). I love their simple silhouettes and color palette & love their support and empowerment of women even more. SHOP HERE. Whimsy + Row is an eco-conscious lifestyle brand founded in 2014 and based in West Los Angeles. Birthed out of a love for quality made goods and sustainable practices, their mission is to provide ease and elegance for the modern, creative woman. Made in limited run batches in Los Angeles, their clothing is handcrafted under ethical conditions using only locally sourced deadstock textiles and materials. SHOP HERE. Each pair of their Compressive leggings starts with 25 recycled post-consumer water bottles. Did you know that almost all synthetic fabrics, like polyester and nylon, are made from plastic? (It’s true.) They make theirs from materials that would otherwise clog landfills and threaten wildlife. Their clothes are made in a SA8000 certified factory in Vietnam pays living wages, provides fair working hours and safe conditions, allows unionization, and uses no forced or child labor. They know. They go there. SHOP HERE. They use 85% post-consumer waste boxes and 100% recyclable paper for their boxes and shippers. They only work with FSC-certified vendors. No virgin forest materials are ever used. SHOP HERE. Beauty brand LOLI, or Living Organic Loving Ingredients is a Zero Waste Beauty™ brand. Never diluted or polluted, always food-grade, fair-trade, organic and ethical. Their packaging is 100% biodegradable, made from glass, or compostable material. They also support the stopping of people trafficking and for every purchase of $75 or more we donate $1 to organizations that are making a difference. SHOP HERE. What are your favorite sustainable brands? There are so many incredible ones popping up and I want to continue to use this platform to educate consumers on just how many options they have. You have so much power in where you put your dollars. Choose brands who choose the earth. Last September I signed up with a business coach for the first time. To be honest, I didn’t really know what that meant or what I was getting myself into, but the fact that Monique integrated spirituality into business felt like exactly what I needed to take my business (& life) to the next level. Working with Monique gave me more clarity about who I am, my purpose, and direction than I have ever felt. We cleared out old limiting beliefs, healed deep wounds, and created a vision so clear with a path that has been unfolding beautifully ever since. I wanted to ask a few questions to give you wonderful humans an opportunity to know Monique and her unique business offering! 1. What inspired you to help others in spirituality & business? While personal readings and integration (healing) sessions are interesting, I found that more and more people wanted to experience more freedom in their life and were stuck on how to feel fulfilled in their job or find their passion or kick off their own business or get their business to be successful. I really resonated with this entrepreneurial spirit and combined with my business background it made sense to use the same intuitive and integration tools in a business platform that was supporting people in their personal lives also. I was in corporate management positions for over 15 years for large lifestyle brands like Levi’s and Quiksilver in operations, business planning and marketing, while simultaneously exploring my spiritual path, becoming proficient at energy healing, intuition and mindset management. Experiencing the magic from our own innate super powers is beyond anything I had experienced and at a certain point I knew I needed to dedicate myself to helping others activate their own abilities and align with that is possible for each of us. I’ve found that our issues in business are the same as in our personal lives. It’s just a different ‘backdrop’ or ‘platform’ so it can appear to be different. As you work on the energy in the business, your personal life will automatically start to align also. 2. Describe your offerings in one sentence. All Intuitive Freedom sessions are aligned with your higher self and will bring you clarity, confidence and a sense of well-being & empowerment. 3. What is your favorite thing about working with your clients? Their vision and natural creative expressions. Everyone is so unique I find it so inspiring to witness. Sometimes, they don’t even recognize how amazing they are themselves. But it will be reflected in the sessions and they will have the opportunity to clear any blocks in the way of them feeling, seeing and experiencing their divine genius and aligned path of success. 4. What do you hope to impart with your clients? That we are all free and empowered to live the lives we desire, despite where we currently are. That we all have amazing intuitive and self-healing abilities. I’m a pretty grounded person (probably from all my corporate roles) and I like to refer to the intuitive space as the quantum field so it can be more widely received when I’m working with clients. I think it’s important to allow people to use their own paradigm to describe it. Some refer to it as guides, spirits, God, universe, etc. To me, it’s all one thing that I see, sense and feel as divine intelligence. 5. Can you recall a time when it was transformational for you to work with someone else? It’s always transformational for me to work with people. I believe we are all holding space for each other’s evolution. There tends to be a lot of validation that comes through during our sessions, whether I am reading them, or they are tuning in for themselves. I find it all truly inspiring and very much so validating to the work that we are doing. When I have the opportunity to tune in to clients’ field and see their vision fully created, it’s the most inspiring thing to me. I can’t help but believe in them as I’m seeing it fully actualized. In addition, the information that comes from the field is beyond my experience, knowledge or ego, so I feel honored to also be able to understand how the universe is working and share profound anecdotes that are shared for clients. All of course coming from their field. My mind simply couldn’t come up with this stuff! It’s truly magical and I’m humbled every time. ﻿6. What are some of your other passions? I’m at total travel addict, for sure. I get tend to get antsy after being anywhere longer than a few months. I’ve been fortunate to get to travel extensively around the world, and to work with clients from around the world as well. Luckily the work I do is mostly done remote via Skype so it’s never a problem. Growing up, I’ve always had a sense to help others and giving back, but I wasn’t clear on how until 2008. I was helping clients start up their surf camp in Nicaragua and discovered that the local school kids didn’t have clean water. Then discovered the entire village had no clean water, not even in their wells. And it was costing them 1/3 of their salary to have clean water delivered. My life changed in that moment and I knew this was my calling to help these kids. After my first successful volunteer trip I decided to create a 501c3 nonprofit organization called SYRV [makegoodhappen] (pronounced ‘serve’ as to be in service to others). We create volunteer lifestyle trips help with our clean water initiatives, education and social development in developing countries. What’s unique is we allow the travelers to share their gifts and passions during our trips as well incorporate personal growth & wellness sessions before and after the volunteerism to really help integrate the entire experience for everyone. We’ve had hundreds of people travel with us and have helped over 25, 000 people get access to clean water. Our next trip will be to Guatemala this summer! 7. What does a program with you entail? You bring your goals, your challenges & any other questions you have around your business and I will translate & share the insights in both broad and specific terms. The more specific the question the more specific the answer. The best thing is, even the most complex issues are solved in The Field. This 3-month one on one program is dedicated to those who are really ready to commit to starting, scaling or aligning their business. It’s a full service, dynamic program that offer you 24-hour support in and being accountable for developing, planning and implanting your business. Or, if you have a business up already, you will be able to align with your goals, integrate any blocks as well as receive intuitive insights and business consulting. You’ll also start to use your own intuition as I will guide you months 2 & 3 to insure you feel confident in your ability by the end of our time together. Efficient goal- oriented platform to log all your notes, work, sessions, intuitive business journal, and more! The intuitive training program is a one on one program is by application as I incorporate this with a specific area for the client. If it’s for business, we will do Intuitive Training Intensives alongside the Business Accelerator Program. I will be launching a separate Intuitive Group Training in May 2019. Intensives are really directed for people who want to put the pedal to the metal. Some people do their best work in person and in a concentrated manner so they can really accelerate without all their day to day distractions. We will work together for 1-7 days, depending on what it is you need. I host Business Intensives in Santa Monica or I can travel to you, and Intuitive Intensives are held in Joshua Tree, CA. They are clients favorite add on to their program and they have extraordinary results as they are achieving things in a much shorter amount of time. I have a conscious marketing agency (Intuitive Freedom Activate) that is able to specifically develop branding, websites, and social media for my business clients looking for more development assistance. As a Business Accelerator Member, you receive 25% off all personal Intuitive Freedom sessions and Intuitive Freedom Activate marketing development services. 8. Can you leave us with your favorite quote? How many years in a row have you come up with the same, uninspiring, redundant list of new years resolutions? Well we were sick and tired of doing the same thing and expecting change, so we created a retreat format that allowed our students to dive into their hearts and create intentions that were aligned with their deepest desires! Friday afternoon our guests arrived to Cactus Moon Retreat, an incredible retreat center in Yucca Valley, or more commonly known as Joshua Tree! They were welcomed with adaptogenic turmeric lattes to sip on while they got to know one another and settle in. P.S. For all of you yoga teachers out there, I highly recommend this space for your own retreats! Soon after, we began our first yoga class of the weekend. The practice of yoga allows one to move past the business of the mind, address the distractions of the body, put them at ease, and become receptive to deeper insights! We used yoga as a tool to prepare the body and mind for visualization and meditation. After yoga, meditating, and our opening circle, our private chef Georgie, of @fearlessbodies, made sure we were very well fed! We are so grateful for Milk & Eggs for providing such delicious, and locally sourced groceries for our girls. The next day we started class at 8am, after gathering in the living room for superfood coffee of course! Yoga and meditation, with a third eye activating visualization was the perfect preparation for our workshop on the subconscious mind. We taught our students the importance of becoming aware of your thoughts, and how your thoughts create your reality. We gave them tips and tools on how to transform limiting beliefs and how to create a year long plan, breaking it down month by month, week by week, and even day by day! Between breakfast and lunch we would pull cards, practice manifesting, and of course prepare for the vision board workshop that evening! As a facilitator of an experience like this, my favorite part is watching how the women connect with one another. It’s so rare that we are given permission, or even encouraged, to just be ourselves. You, reading this, let me just take this moment to remind you that you are beautiful, perfect and wonderful just for being you! After spending the whole weekend getting clear on what we wanted to call in and create this year, mapping out a plan, transmuting limiting beliefs and setting intentions that were purposeful and aligned with our highest selves, we boiled every single intention down to one word. I hand stamped bracelets from My Intent to send the girls off with a reminder of what they cultivated this weekend. Dying to come to a retreat? Click H E R E for more info on our next Joshua Tree retreat, March 11-13th.